Sometimes, despite not being Team Grapplegate (see #BestJamieSuzanne), a ghostie will just knock a book out of the park, and at least one of us will be charmed. Usually all three of us. 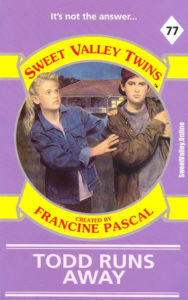 Wing recaps Sweet Valley Twins #77: Todd Runs Away, and, shock of all shocks, REALLY LIKES TODD WILKINS. 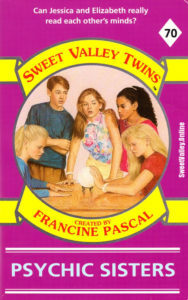 Who replaced her with some sort of Sweet Valley pod person?! 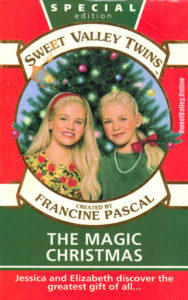 Dove recaps Sweet Valley Twins Magna Edition #1: The Magic Christmas wherein the emphasis is on the Magic rather than the Christmas, dolls can move, creatures die, and gosh, this summary sounds dark. 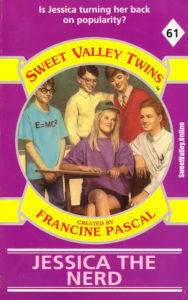 Raven recaps Sweet Valley Twins #64: The Charm School Mystery, which abounds with mystery and a little schooling, but has infinite charm. 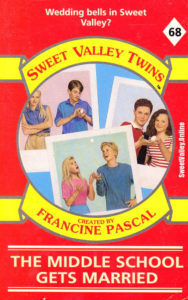 Dove recaps the best book in the series, Sweet Valley Twins 63: Poor Lila!, wherein Lila is poor, the twins are nearly absent and EVERYONE is sassy. 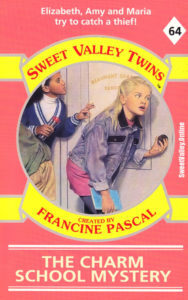 Raven recaps Sweet Valley Twins #61: Jessica the Nerd, in which Jessica is forced to choose between Nerds and Unicorns, with surprising (and entertaining) results.